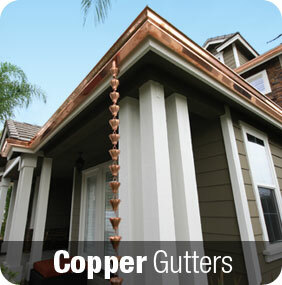 Copper gutters are very visually pleasing. Rain gutters are one of the most critical parts of our houses and the roofing systems. They can be called as a onetime investment. Thousands of gutters are installed every year throughout the world. Yet there are people who do not have enough information about them, how they are installed and how much they should cost. But with the advancement in technology, you can always gather as much information you want from the internet. There are various gutter installation sites where you can study and know about the different rain gutter styles, their costs and how they are installed. You can also learn about the equipments which are required for their installation. You can learn how each different piece is combined together to form the whole system. There are 2 basic types of rain gutters divided on the basis of their shapes of their cross section. Both these types come in 5 and 6 inches of width. K-style gutters – These gutters generally have flat backs and bottoms and the frontal side consists of decorative shapes like the ogee or the curves which resembles the crown moulding. Half-round gutter – As the name in itself says, these gutters have half round tubes. These are generally found on the older, historic houses. Generally, the former one has twice the capacity of the latter one of the same width and the cost of about 50% more per linear foot. The most common sizes which are able to handle the rain water are the 5” K-style gutters and 6” Half round gutters. But the houses which are steeper that the usual houses may require bigger gutter sizes and additional downspouts to avoid overflowing of the rainwater. To know the size of the gutter that you are going to need for your house, first you need to measure the square footage area of your gutter drainage. 2 calculations are required for simple gable-end roof, one for each slope and then you need to add up the area of each surface to get the total square footage. Aluminium gutters come in white finish which enhance the beauty of your house and gives a durable construction. These days, you can get aluminium gutters which can be added to your existing gutter system. These are do-it-yourself type and are very convenient to set up. They help in preventing erosion and controlling runoff. They are low- maintenance. You can get them in K-style design for beauty purpose. These gutters protect walls and are used to replace, repair or add on the existing 5” gutter system. The installation of aluminium gutters is comparatively very easy. Gutter brushes and guards and covers- Keeps away he debris, leaves and acorns from your gutters. Splash Block- Prevents the washout at the bottom of the downspout. Downspout extension- Keeps water away from the foundation of your house. Other tools and supplies include scaffolding and ladders, sealants and caulks, power saws and power drills. These are also used for proper installation of your gutters.